Imagine that you are blind. Someone is reading a story to you. It might be a news story. It might be an essay. It might be fiction. The page is turned and your reader discovers that in lieu of words, the author has inserted this image. What words should the reader say to you to convey that image? Or, imagine that you are reading the piece for yourself and you turn the page, the author wants you to have that image as part of the story, but there is no artwork. What words should he write to convey it to you? If an author does not trust the reader, there is a tendency to over-write the description. Example: “It was an accumulation of hegari-based harvest product, probably wheat stalk, some fourteen meters in circumference and four meters in height, in the shape of a half-hemispherical ovoid, with shadows of a length associated with a southwesterly orientation at one-half hour after sunrise, blurred by ….” Snooze. If the author is lazy, he will describe it by a title. 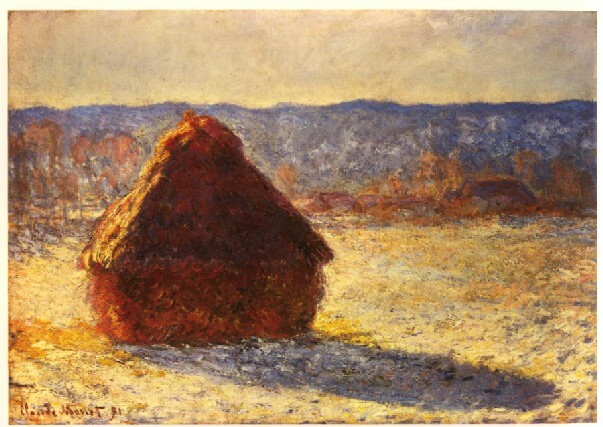 “His favorite picture is Monet’s Haystack.” (Q: Does the lazy author know which one is his ‘favorite’? The reader sure doesn’t). Finally, in an effort to make a reader believe that precision is really important, some authors write what it is not. ‘It was not a stack of hay bales. It was not a hay rick. It was not a pile of hay. It was not….’ Well — what was it, then? The craft of writing imagery is at least as important as the art of writing characters. Understand the image you want to convey as well as you understand your characters. If it is core to the story, answer the same dozen or so questions about the image that you would for a character so that you grasp its essence. Second, write only enough that the reader will re-create the image for himself. I know what a ‘moor’ is because Sherlock Holmes took me to one, although I’ve never been to one in person. Holmes only told me that it was desolate, treeless, boggy, and had a hound in it. That was all I needed to imagine for myself what the scene looked like. Finally, economise. Except in technical manuals and criminal reports, the reader neither needs nor wants the thousand words that a picture is worth. Do it in ten words, or twelve. Now, try it. Seriously. Write the scene of this picture in ten or twelve words. Eliminate those that are not essential to your story and those not essential to what you want your reader to imagine. Organize those that you keep into an efficient phrase that invokes the picture but allows your reader to draw it. Better still, write the scene description at least three different ways. Each time, focus on a different aspect of the scene, such as the haystack, or the morning light, or the indistinct trees in the background. You will see, when you do it, that the scene is much like the story itself — a balance between the main story and interesting back stories. Which is which is entirely up to you. Writing is not a competition. It is an art. Authors become better only with practice, not by resting on past work.